Most international airlines seem to recognize the benefit of keeping babies happy on long-haul flights. Many international planes have bassinets that hook onto the wall in front of the bulkhead seats. If you are travelling with a baby under 2, and a bassinet is available, the airline will seat your entire party in bulkhead and provide you the bassinet, free of charge. 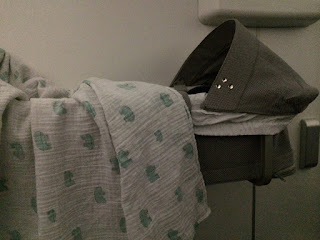 Be sure to call the airline when you make your reservation to alert them that a baby is travelling with you and to try to reserve the bassinet seating. If a non-baby-party has already taken the bulkhead seats, they'll be bumped to other seats to accommodate you and your little one. On airplanes not equipped with bassinets, the airline will do its best to get you an extra seat. So before you pay for an extra seat for your baby, call the airline to see how they can accommodate you for free. You can usually buy an extra seat at the gate if it turns out the baby accommodations are all taken. Worst comes to worst, there are no special accommodations, and no extra seats available for purchase, and you turn to Benedryl.